Locally made candy with local ingredients. You have got to check out these bars! It’s not a party without some candy! And these locally made and sourced candy bars are the bomb. 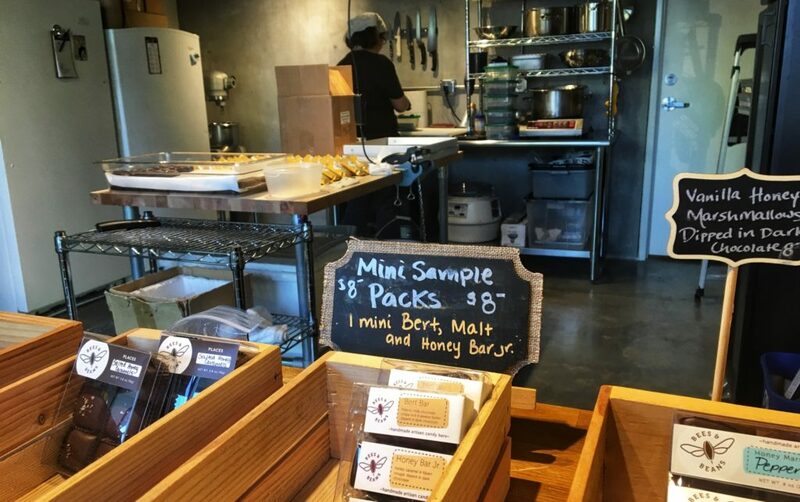 Bees & Bees bars are made and sold out of a store front on East Burnside. You can find their Honey Jr. bar at Whole Foods and News Seasons all over Portland, but I highly suggest stopping in to the store. When I visited the owner gave us samples of EVERYTHING and it was fun to see their candy making operations. It was so much fun! They sell a bunch of candy bars, marshmallows and some Pate de Fruit. Everything is made with local ingredients (or as local as they can get) honey, dairy, nuts, mint and domestic chocolate! The bars are a little spendy but as a treat or a gift, I say go for it. I walked out with a variety pack for stocking stuffers. Best chocolate bars I have ever tasted!